ICTA conducted its first Corporate Training for 2016, at SLIDA from June 6th to 8th. The training covered Performance Testing on Apach Jmeter. The instructor was Mr Tharun Prakash. Tharaun is a qualified software test consultant/trainer with 10+ years of experience in software testing with an ambition to build World Class software testing teams. He has Conducted Performance Testing, JMeter, Loadrunner, SoapUI, Software Testing, Mobile Testing and Agile Scrum trainings to delegates around the world and has trained over 400+ delegates from India, Australia, Nepal, Sri Lanka, USA, Philippines, Indonesia and UK. He has Core experience in JMeter, LoadRunner, Performance Center, SoapUI, Appdynamics, Hyperic, VisualVM, JProfiler. ICTA facilitated, and part funded the training. 31 employees from 21 organizations were able to take part in this 3 day comprehensive workshop on Jmeter. ICTA always seeks the insights of the industry experts in initiating and shaping its corporate workshops. 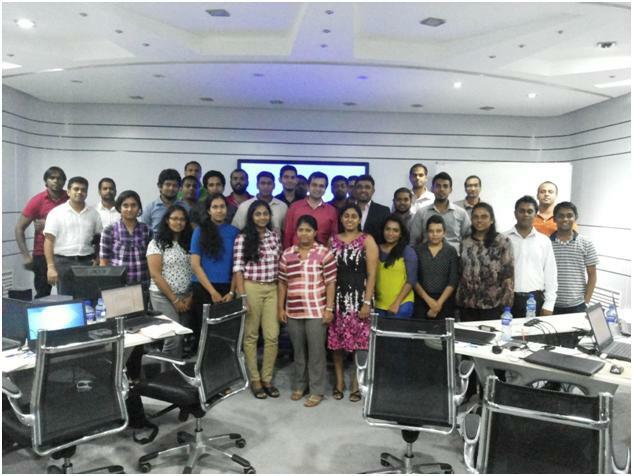 For this training on Jmeter, industry experts contributed their valuable insights and suggestions to improve the course content and make the training fine-tuned to for the Sri Lankan IT Industry. This 3 day Training Session on Apache Jmeter provided participants with must-know strategies, tactics and best practices which can be used to build a strong foundation for successful performance testing. The training was focused on the following key areas: Introduction to Performance Testing, Performance Testing using JMeter, and integration of other tools with Apache JMeter. The target audience was Quality Assuarance professionals, who are already aware of Manual Testing concepts and Software Developers, who are willing to improve the performance of their applications and fine tune their applications. Day one of the workshop started with a recap on Performance Testing Concepts like Stress, Load, Regression, Spike, Soak testing, etc. and points on Managing performance testing projects. Then Jmeter Basics were discussed which was followed by a demonstration and a hands-on assignment. Elements of a test plan were next discussed and demonstrated which was again followed by a hands- on exercise. Day 2 started with a discussion and demonstration on building a web test plan which was also followed by a hands-on exercise. Next handling correlations in Jmeter was discussed and demonstrated and participants also did the hands on assignment on Applying Correlation. This was followed by discussion, demonstration and hands-on assignment on Listeners, Remote/Distributed Testing. Day 3 started with demonstration and hands-on assignment on Building a Web services Test Plan followed by Building a Database Test Plan. Resource Monitoring, Analyzing and Interpreting Load Test Results, Using Plugins in JMeter, Bean Shell Scripting with JMeter, and Best Practices in Jmeter were discussed later in the day. Throughout the workshop participants actively engaged in the training and resolved many doubts they had. The workshop ended with a Question and Answer session which was followed by the certificate awarding. As an after-event to the workshop ICTA was able to organize a meetup in collaboration with Pearson Lanka, Mr Tharun and Aslam Ashraff from Pearson were the key speakers of the event. The meetup was well attended with over 60 participants present.